Right now is an incredible time for flowers! Where I live, the crab apple trees are bursting into bloom, the red buds are turning purple, and the lilacs are just hinting at the colors and scents to come. Read on for some simple tips to help your flower photographs stand out from the rest. 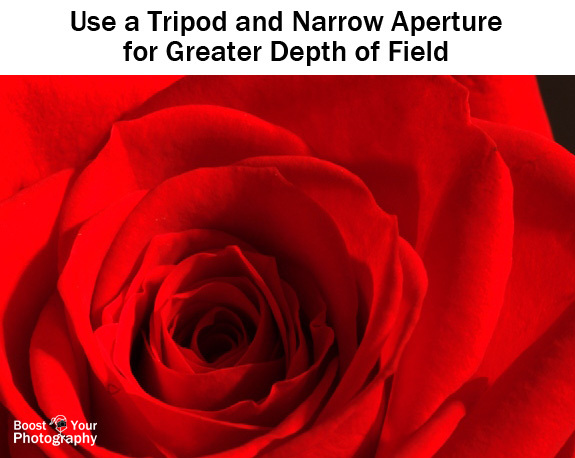 Try both vertical and horizontal orientations for your flower photographs. Individual blooms or a thin vase can be accentuated by a vertical orientation. Groups of flowers might work better as a horizontal shot. Do not let your interest in your subject overwhelm your attention. 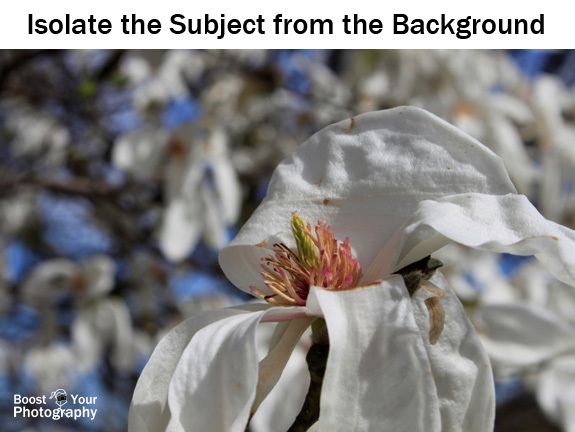 Think just as much about the background of your photograph as you do about the flower itself. 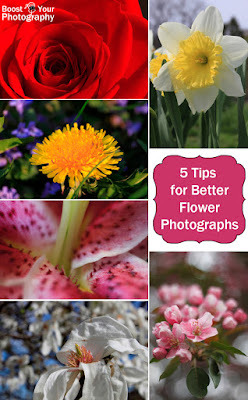 Moving yourself slightly or choosing one flower over another nearby can make a dramatic difference in your photograph. Aperture priority mode allows you to set the aperture on your camera, while the camera chooses the shutter speed (and ISO if you use auto ISO). Read more about aperture priority mode here, or read up on aperture itself here. 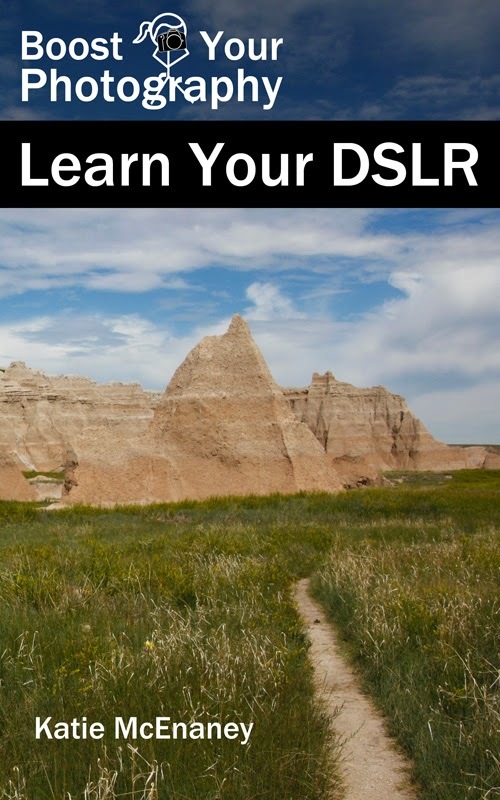 Use a wide aperture if you want to blur the background and isolate your subject. 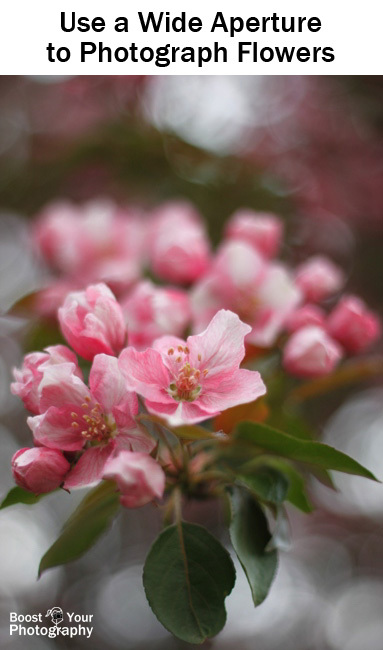 The crab apple blossoms above were shot with an aperture of f/1.8. While the front flower is in focus, the focus fades very rapidly, resulting in the pleasing background blur. Background blur can also be achieved at narrower apertures, if you pay attention to the placement of your subject relative to the background. Here, the flower in the front is significantly closer to the camera than the rest of the tree. 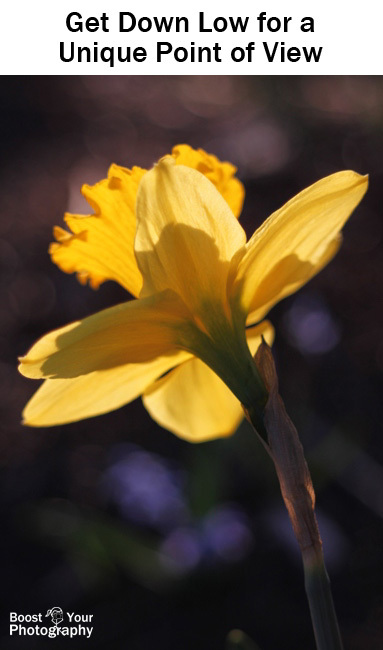 An aperture of f/11 was used to keep the entire flower in focus, front-to-back, while the greater distance of the flowers in the background allows them to remain out of focus. 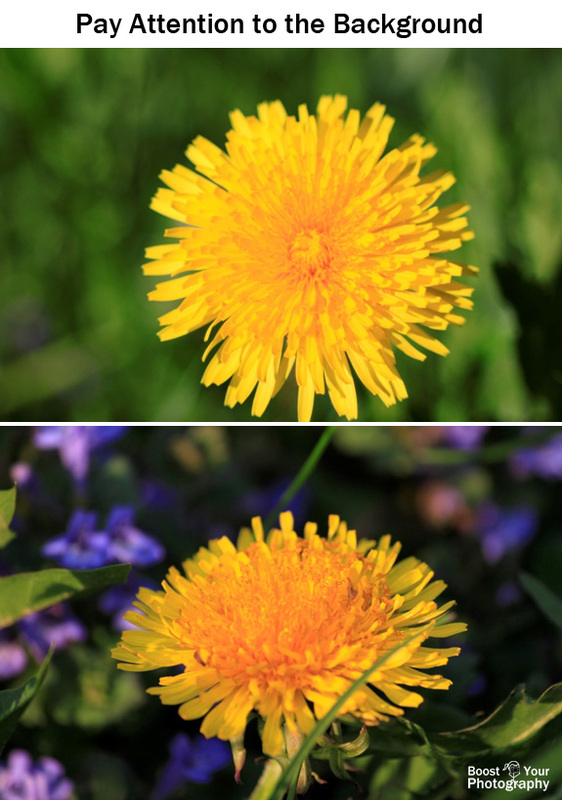 You can also use a narrow aperture (generally with a tripod) to get a crisp photograph of the entire flower close-up. This rose was shot using a 30-second exposure at f/22, with the camera mounted on a tripod. This was done inside, to avoid any possible movement of the flower due to wind. No tripod? No problem. You can also use a technique called focus stacking to create a super-focused photograph out of a series of photographs shot at varying focus points. 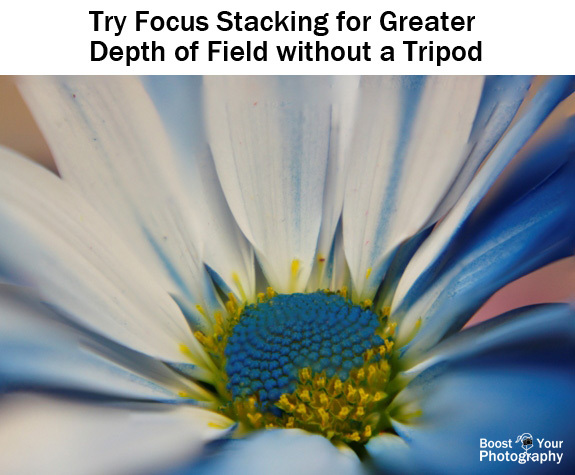 Read the full details behind focus stacking here. Many times, we feel tempted to include the entire flower in the photograph. That's fine, take that shot. But then move closer. Or zoom in further. Fill the entire frame of your shot with just one part of a flower. Find and isolate an interesting detail. We love to sniff flowers, and our default tendency is to view and photograph flowers from that point-of-view: just above and looking down. 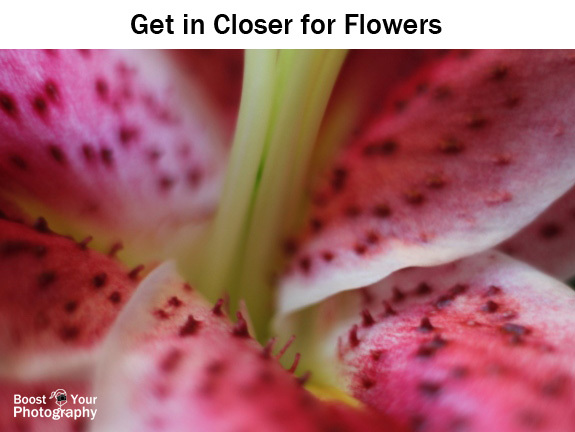 If you want to do something a little more original with your flower photography, you need to try a different perspective. What's your favorite tip for incredible flower photographs? 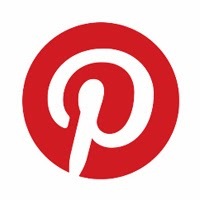 Share a tip or image in the comments!